← Cypser, Darlene. * The Consulting Detective Trilogy, Part I: University. Morrison, CO: Foolscap and Quill, 2012. Oh, the stories he could tell…. Darlene Cypser, author of the popular look at Sherlock Holmes’ beginnings, The Crack in the Lens, and its sequel, University (part of the planned Consulting Detective Trilogy), has been an active participant in the Sherlockian world since her own youth. In addition to her two novels and short stories (see below), she is also an attorney, small press publisher, and film producer. As someone who can take two hours to do the dishes, I am quite impressed, and happy that she found the time to answer a few interview questions…. First, of course, the question I ask everyone: How did you first encounter Sherlock Holmes and Dr. Watson? Which is your favorite story in the canon, and why? And if you have one you don’t like so well, tell us about that one, too. Do you read any pastiche, or other non-Doylean works about Holmes? If so, do you have a favorite book, story, or author, and why do you like them? I have read many, many pastiches. What I find most important in a pastiche is that they get Holmes and Watson and their relationship correct. Too many pastiche writers are basing them on TV or movies which mostly get them wrong. It is absolutely necessary to read the Canon over and over to understand the characters and be able to write them. Once you get that correct you can go off on your own theories successfully. Writers also should check their historical data, which is so easy to do these days. I still like The Seven Percent Solution. A couple of odd ball pastiches that I really enjoy are the science fiction Time Enough for Sherlock Holmes and Cay Van Ash’s Ten Years Beyond Baker Street — a Holmes/Fu Manchu cross-over. I think Lindsey Faye did a fine job on Dust & Shadow but The House of Silk was poorly written and edited. You’ve been involved in scion societies for quite some time. How did that come about? As I said, Julian Wolfe who was “Wiggins” of the Baker Street Irregulars at the time introduced me to my first scion in New York. I tried to connect with some others during college and law school but I didn’t always have transportation to where they were meeting. I had heard of “Dr Watson’s Neglected Patients” when I lived in Boulder but I was starting my law practice and raising my son. I didn’t have a chance to connect with them until 2005. Now I am the “Chief Surgeon” of the Neglected Patients. We are the only scion in Colorado. The east coast has a lot more scions close together. They are more sparse in the west. I visited with the Desert Prospectors, a new scion in Tucson, AZ, in December. I have also been a member of the Hounds of the Internet, a scion that is a e-mail mailing list. Your two novels aren’t your only foray into writing about Holmes. Tell us about your other writing. I have written many things about Sherlock Holmes which have not yet been published. If we only include those that have been published, the first were two “trifling monographs” which were published in the Baker Street Journal in the 1980s. “A Capital Mistake: An Apocryphal Rebuttal,” and “Barker, the Hated Rival.” The former is a response to another writer’s article about “The Lost Special” and “The Man with Watches,” two stories considered part of the Holmes apocrypha. The latter was linking Cecil Barker in The Valley of Fear with Barker in “The Retired Colourman.” Those were published while I was in law school. I just published in the Neglected Patients’ “Medical Bulletin” a week ago another essay called “The Curious Incident of the Dog in the Courtroom” which I actually wrote about 6 years ago. Many people who write about Sherlock Holmes choose to write about him as an adult. They choose a case from the dispatch box, or match him up with a contemporary figure or event. Why did you decided to delve into his early years, about which we know almost nothing? Because we know so little. Like everyone else I’ve speculated over the “untold tales” but the truth is that ground has been gone over so many times that it is not interesting. What interested me first was how did Holmes get the way he is? I don’t agree with those who claim he was always that way. No one springs “full formed” like Venus. We are all influenced by everything that happens to us. You used Baring-Gould’s biography of Holmes as one source. Where else has your research led you? I consulted many, many references. Most of the research for The Crack in the Lens was done in public libraries and college libraries across the country. I didn’t always have enough money for photocopies. So I have pages and pages of hand transcribed notes from books.†† I used some fairly modern books like James Herriot’s and many books written by Sherlockians about the world of Sherlock Holmes. But I also hunt down books written in the Victorian era, both fiction and non-fiction. They help me recreate the world in which the characters move. This is a lot easier now that I can download such books from Google Books or Archive.org. I do consult the “Higher Criticism” by Sherlockians on matters such as which college Sherlock Holmes attended. Whenever I write a male character, I always worry that I won’t get it “right.” Have you found it challenging to get into the mind of a young man in his late teens/early twenties? It is a challenge, but I think it is more of a challenge to get in the mind of someone who lived 150 years ago. A young man of today has many different thoughts and concerns than a young man of that time. One of your books’ strongest points is their gradual depiction of Holmes’ development. Do you chart this out in some way, or does it happen more organically? I don’t have a chart that says Holmes changes in this way at this time. I know where I start and I know where I have to end up — that is with the Sherlock Holmes whom Watson meets in The Study in Scarlet. I look at the surroundings and who and what would have been there then for Holmes to interact with. I look at the Canon for elements of Holmes’ character, knowledge and experience that might match with those. Once I have my cast of characters I let them play out the scenes in my head. They tell me their stories. Some take on greater roles than I anticipated. Jonathan was one of those. The book Sherlock Holmes consults in his efforts to salvage a fellow student’s reputation, written by his friend and physician. You based the character of Dr. MacKenzie on Dr. George Mackenzie Bacon, an actual person. How did you encounter him, and why did you decide to use him as a character? Dr. Mackenzie was another character who took on a much greater role than I anticipated. 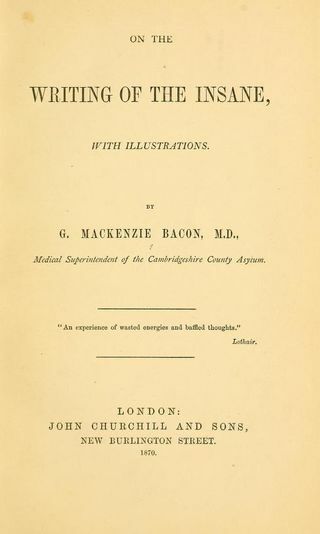 When I was studying Cambridge of that time period, especially the medical facilities at that time, I encountered records mentioning Dr. Bacon. He was the medical superintendent at the Cambridgeshire Asylum near Fulbourne outside of Cambridge. From everything I read he was a very intelligent and sympathetic man. I literally fell in love with the man. I read about his whole family, who were prominent printers/publishers and supporters of the arts, especially music, in Norfolk. Another Sherlockian helped me track down all his publications that I could find references to. That helped me rebuild his character. I changed the name in part because I was doing a reconstruction. I hope some day I can do a biography of the real man. That would take a lot more research. When I met Dr. Bacon it clearly struck me that this was the man that Holmes needed to meet to really recover from what happened to him in the earlier book. Holmes needed to understand what was going on inside his own head in order to deal with it. For that I reconstructed the character of Dr. Mackenzie from Dr. Bacon. Dr. Mackenzie will make a brief cameo in Part II of The Consulting Detective Trilogy. It will deal in large part with an issue that was only briefly touched up on Part I: Holmes’ interactions with women and feelings towards them. It is much different from their encounters in Part I. It is almost as if Holmes cycles through the entire emotional and psychological journey of Part I in the space of a few hours. He then makes a conscious decision. The fact that he can do so is a testament to how much more in command of himself he is at that point. We will again be exploring his strengths and his weaknesses, and the choices and sacrifices he makes to become the great detective. You will have to wait a while for the answer to that one. Holmes himself does not find out the answer until late in his career. I’m not going to tell how he solves that out of context. Darlene Cypser is the author of The Crack in the Lens (reviewed here 2/25/12), and The Consulting Detective Trilogy, Part I: University (reviewed here 7/11/12). She has also written two well-received short stories about Sherlock Holmes, “The Adventure of the Apprentice’s Coin,” and “The Mystery of the Ghostly Bells.” All are available on Amazon, and the books may also be found at these retailers: http://www.thecrackinthelens.com/buy.html. Each book has a comprehensive website: http://www.theconsultingdetective.com, and, of course, http://www.thecrackinthelens.com, as well as a Facebook fan page and a Twitter feed. †Both of these short stories are available on Amazon, and both are quite enjoyable. In “The Adventure of the Apprentice’s Coin,” Ms. Cypser takes the unique tack of telling the story twice, using two different points of view. ††Oh, I have so been there! †††Ok, that’s eleven questions, but I had to try, didn’t I? Thanks Leah, for providing more information about Darlene’s Holmes’ writing. More to add to my collection!